Experience an exciting mix of hiking, cycling, trekking and rafting on this 11-night tour of Bali and Lombok, two of Indonesia’s most popular islands. Picture white-water rafting through a forested gorge, hiking an active volcano and cycling through lime-green rice paddies. These are just some of the adventures to look forward to on this tour. The journey starts in Bali and takes in Lombok’s mountains, beaches and jungles, before ending on the tropical Gili Islands (INT - TIXB). Enjoy an adrenaline-pumping white-water rafting adventure in Bali. 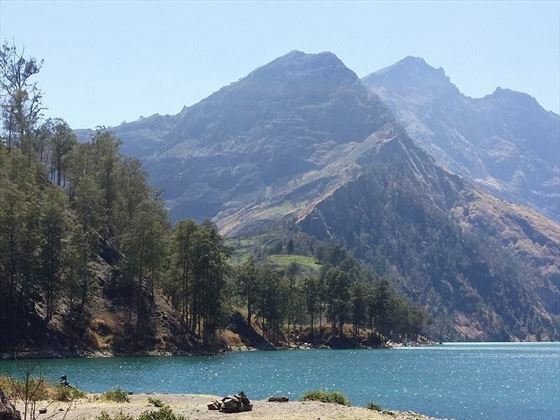 Hike up Mount Rinjani, Lombok’s majestic active volcano. Spend a day cycling through beautiful Balinese countryside, villages and rice paddies. Trek to Tenganan Village to sample rural life and visit stunning Lempuyang Temple. 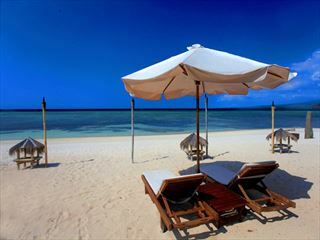 Relax on both white and black sand beaches in Lombok. Snorkel off the paradisical Gili Islands to see diverse underwater life. Welcome to Indonesia! 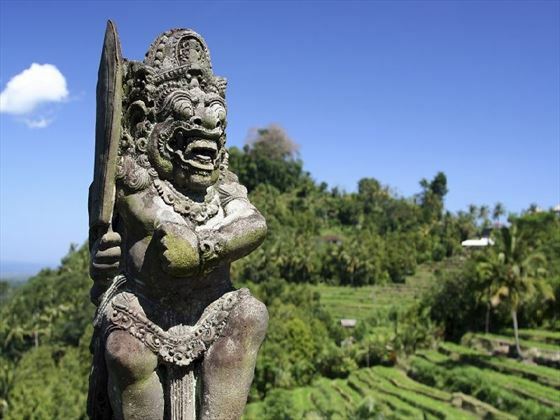 Your adventure begins in Bali’s cultural heart, Ubud. This tranquil town is known for its surrounding rice paddies, sacred Monkey Forest, arts, crafts and selection of yoga centres and spas. Join the 6pm welcome meeting at your hotel, but if you arrive before then, take the chance to explore. You can trek in the Kerobokan rice fields, head to a spa, take a Balinese cooking class or shop and eat at the local Gianyar night market. After breakfast, you’ll embark on a white-water rafting adventure just outside of Ubud. Take on class one and two rapids as you whiz down 11 kilometres of river gorge lined by lush forests and rice paddies. The rafting will last around two hours and finish with a hot shower and buffet lunch before you return to Ubud. Take sandals that can get wet, as well as a sturdy pair of shoes for the climb to and from the river. Spend the afternoon as you please, wander around Ubud, chill out with a Balinese massage, visit trendy cafés, or take an Indonesian cooking class. The Don Antonio Blanco Museum of Renaissance art and the Monkey Forest are also worth a look. For evening entertainment, check out a colourful Kecak dance performance. Make the two-hour journey from Ubud to the foot of Mount Agung, where your cycling trip starts. You’ll wind 27 kilometres along scenic trails through bamboo forests and orchards, past local villages and through rice paddies. Most of the route is downhill and you’ll end up at a white-sand beach, where you can spend time relaxing, sunbathing and swimming in the clear waters. Grab some lunch in a café overlooking the sea and then head to your next guesthouse, which has fans and cold-water showers. Start the day with a visit to the impressive Tirta Gangga Water Palace and then get your trekking shoes on today for a six or seven-hour hike to Tenganan Village. As you trek through the unspoilt countryside, you’ll pass the Buddhist Brahmana settlement and stop off at a vanilla and cacao plantation, where you can taste some of the goods. Continue to Gumung, where you’ll get sweeping views over the towering rice terraces set against Mount Agung. The final stretch of your trek winds through a shady bamboo forest, emerging at the ancient Balinese village of Tenganan. Today you’ll take a 30-minute minivan ride to Pura Luhur and ascend 1,700 steps to Lempuyang Temple. There are six more ornate temples to discover along the climb, so the entire journey can take up to six hours in total. 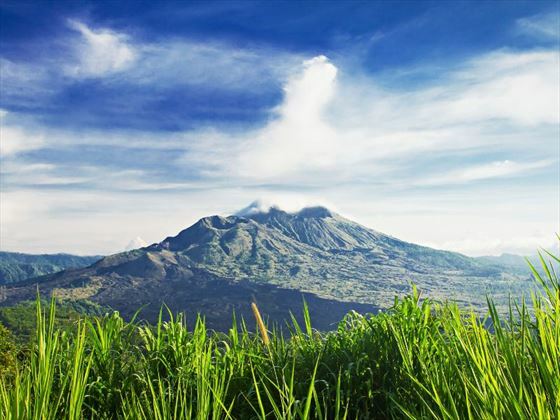 Once you reach the top, you’re rewarded with staggering views of Bali’s highest mountain, Agung. Look out for resident Long-Tailed Macaques and soak in the peaceful temple ambience. Head back to your waterside guesthouse, which sits on a striking black beach, for a soothing end to the day. Enjoy a free day in your slice of beach heaven. Sunbathe, stroll along the shore, swim in the topaz sea or take a gentle yoga class. The water here is clear and ideal for spotting underwater life, you can rent a snorkel to catch a glimpse of colourful fish and coral. If you’re into diving, you can also arrange a trip to see the famous nearby US Liberty Wreck, one of the country’s top dive sites. 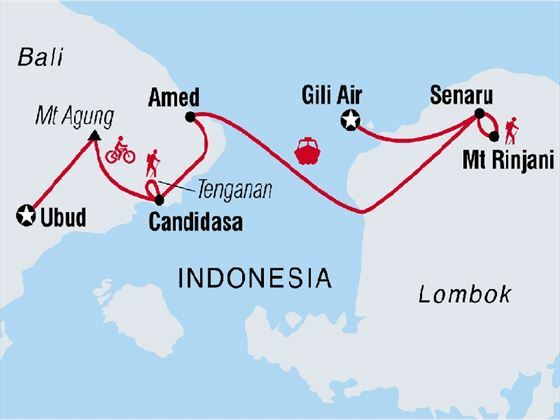 Today you’ll set off for the island of Lombok. Take a fast boat to Senggigi and tour a local Sasak village to learn about the history and culture of those who live around Mount Rinjani, Lombok’s active volcano that stretches over 3,700 metres above sea level. Later, you’ll meet your local guide, who will take you on the trek up Rinjani the next day. The guide is from an organisation that trains local women to work in tourism and will discuss waste management and safety with you this evening. 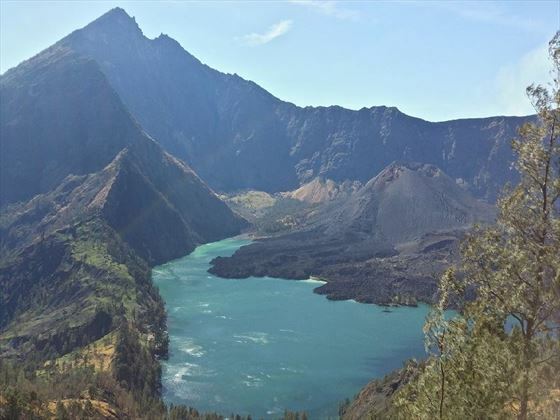 Pack an overnight bag in preparation for your trek and be aware that when there’s increased risk of volcanic activity, hiking routes on Mount Rinjani may be closed for safety reasons. Rise early for your full day trek, departing at 8am. Along the way you’ll cover many different terrains, from rock and gravel to grass and dirt, so wear sturdy shoes. Stop to take in the views over the island and watch out for wildlife, including monkeys and butterflies. The route takes you through forest and grassland to sheer gravel paths, which are challenging to scale. 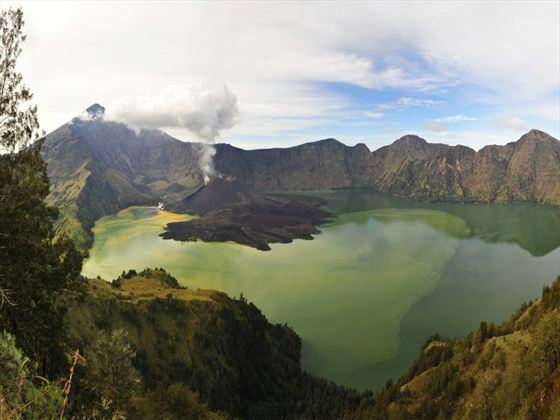 You’ll reach a campsite which sits at 2,600 metres above sea level, just below the crater rim. 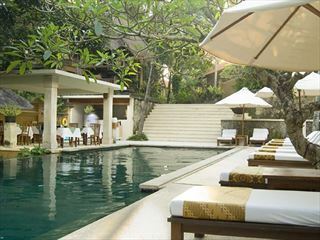 Take in the views, which stretch as far as Bali and the Gili Islands, and fall asleep to the sounds of nature. All camping equipment is provided, including tents, mats and sleeping bags, which porters will carry. You’ll need to take your overnight bag and bring plenty of layers and warm clothes, including hats, down jacket and gloves. Wake early for a neon sunrise and 7am breakfast before saying goodbye to the incredible views and descending to Senaru Village. You’ll take a walk to a cooling waterfall in Senaru and spend the rest of the day recuperating after your hike. Ready for some beach time? Travel 90-minutes to Telak Naru and take a boat to Gili Air, one of three islands which are famed for their pristine golden sands and coral-rich azure waters. There’s no motorised transport on the Gilis, and these islands offer a true slice of exotic paradise, so settle in and enjoy. Spend the day exploring the area’s rich underwater life with a snorkelling trip. All equipment is included and you’ll be taken out on a rustic wooden boat to the best snorkelling spots in the Gilis. 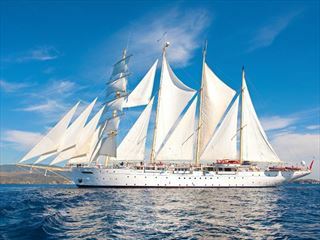 You’ll have a chance to see all kinds of fish and even sea turtles, as well as vibrant coral reefs. There will be free time later in the day for sunbathing, optional activities include cooking or yoga classes. Note that snorkelling may be cancelled if the weather is too rough for boats. There are no activities planned and you can leave any time after breakfast. Make sure you book a fast boat in plenty of time for your flight if you’re departing from Bali or Lombok airport. 8 nights in a hotel, two nights in a guesthouse and one night camping. All transport including boat, bicycle, raft, private minibus and private van. 11 breakfasts, four lunches and one dinner. Activities: white water rafting in Ubud, cycling day trip and Tenganan Village visit in Candidasa, Senaru waterfall walk, Mount Rinjani trek and snorkelling on Gili Air.